Create a Xamarin.Forms custom map. 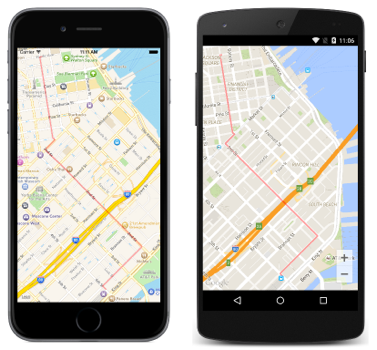 Consume the custom map from Xamarin.Forms. Customize the map by creating a custom renderer for the map on each platform. Xamarin.Forms.Maps must be initialized and configured before use. For more information, see Maps Control. For information about customizing a map using a custom renderer, see Customizing a Map Pin. The RouteCoordinates property will store a collection of coordinates that define the route to be highlighted. This initialization specifies a series of latitude and longitude coordinates, to define the route on the map to be highlighted. It then positions the map's view with the MoveToRegion method, which changes the position and zoom level of the map by creating a MapSpan from a Position and a Distance. A custom renderer must now be added to each application project to add the polyline overlay to the map. The MKMapView.OverlayRenderer property is set to a corresponding delegate. The collection of latitude and longitude coordinates are retrieved from the CustomMap.RouteCoordinates property and stored as an array of CLLocationCoordinate2D instances. The polyline is created by calling the static MKPolyline.FromCoordinates method, which specifies the latitude and longitude of each point. The polyline is added to the map by calling the MKMapView.AddOverlay method. The OnElementChanged method retrieves the collection of latitude and longitude coordinates from the CustomMap.RouteCoordinates property and stores them in a member variable. It then calls the MapView.GetMapAsync method, which gets the underlying GoogleMap that is tied to the view, provided that the custom renderer is attached to a new Xamarin.Forms element. Once the GoogleMap instance is available, the OnMapReady method will be invoked, where the polyline is created by instantiating a PolylineOptions object that specifies the latitude and longitude of each point. The polyline is then added to the map by calling the NativeMap.AddPolyline method. The collection of latitude and longitude coordinates are retrieved from the CustomMap.RouteCoordinates property and converted into a List of BasicGeoposition coordinates. The polyline is created by instantiating a MapPolyline object. The MapPolygon class is used to display a line on the map by setting its Path property to a Geopath object that contains the line coordinates. The polyline is rendered on the map by adding it to the MapControl.MapElements collection. This article explained how to add a polyline overlay to a map, to show a route on a map, or form any shape that's required.